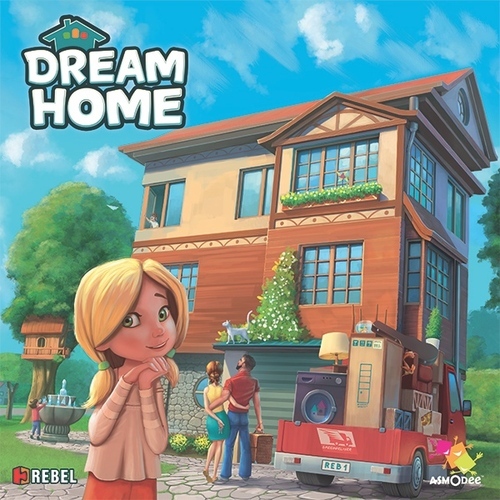 Dream Home is game about building your dream house, or at least building a dreamier house than all of your competitors. 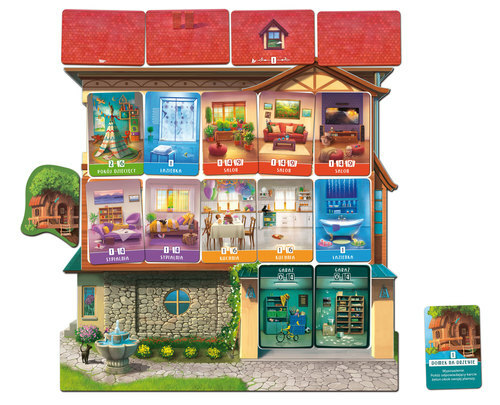 In this game, each player gets a home board which has twelve room spaces in it – 2 upper floors of 5 rooms each and a two room basement. There are two decks of cards in the game, one for rooms and one for resources. 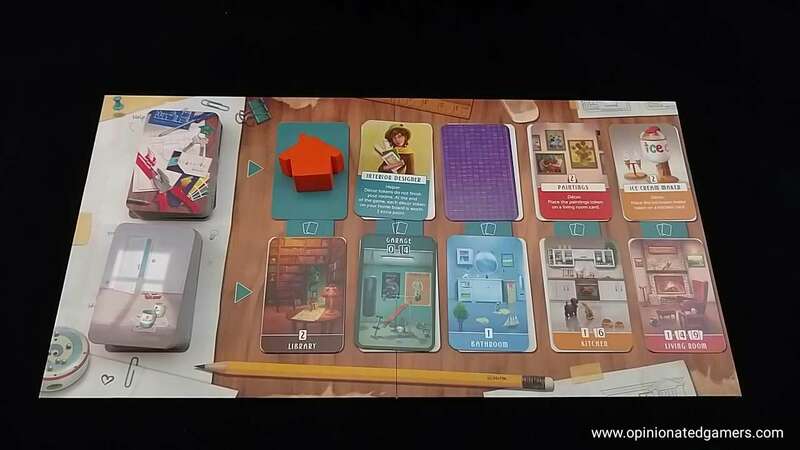 In most rounds, players will get a pair of cards (one room and one resource) to use in building the home of their dreams. There is a game board which is placed in the center of the table. There is a row for room cards on the bottom and a row for resource cards on top – though the leftmost resource space will always be left empty. In a round, the current starting player chooses any of the five columns of cards – taking both cards in that column. The chosen room card must immediately be placed in his house (rules to this to follow) and then the resource card is dealt with appropriately – depending on the type of card that it is. The next player in turn order then chooses from the remaining columns and also deals with the cards. If any player chooses the left most column, they will only get a room card, but they will take the first player token and be the player who chooses first in the next round (and essentially remains first until someone else chooses the leftmost column). There are a few rules to consider when placing a room. First, only basement cards can be played in the basement, and other rooms must always be played in the top two floors. When placing a room card, there may never be an empty space directly beneath it. 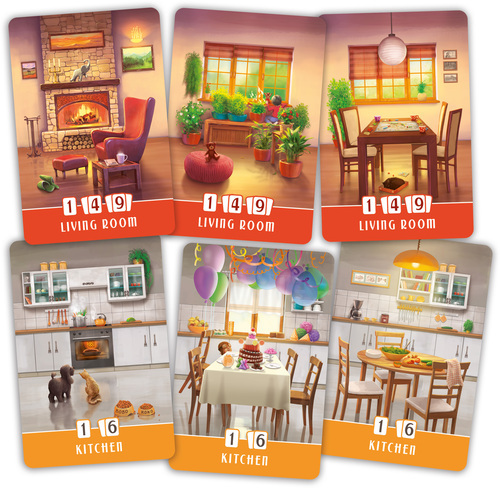 Some cards may be expanded (for example, you living room can be anywhere from 1 to 3 cards in width). You may never expand a room beyond its maximum size as printed on the card. Some of the resource cards have décor items on them. Once you play a décor item to a room, that room is considered finished, and it may no longer be expanded. You may not play two cards of the same room type directly adjacent to each other on the SAME floor. If at any time you are unable to play a room card, you place it facedown as an empty room. There are a number of different types of resource cards. The first is the roof card. When you choose a roof card, you place it facedown in a stack near your basement. You cannot look at them once you place it until the end of the game. The second type is décor cards – there are elements which can be added to specific rooms. When you add them, the décor automatically finishes that room, and the décor item will provide victory points at the end of the game. There are also helper and tool cards. Each of these gives your special abilities and sometimes exceptions to the general rules for the game – simply read the rule on the card and apply it at the appropriate time. After all players have had a chance to choose a column on the board, any remaining cards are discarded from the game and the board is refilled with new cards from the respective decks. When the decks are depleted (After 12 rounds), the game is over and the houses are scored. Rooms – each room in your house is scored. Rooms that can be expanded often offer increasing scores based on size – this is always printed on the card. Home Functionality – you can score a 3 point bonus if each of your upper floors has a bathroom. You can also score a 3 point bonus if your house contains a bathroom, kitchen and bedroom. Roof – Now you look at all your roof cards and try to score the best you can. You need at least 4 roof cards in order to have a complete roof. If you can create a 4-card roof of matching color, you score 8 points. If the roof is complete but of mismatched colors, you score 3 points. 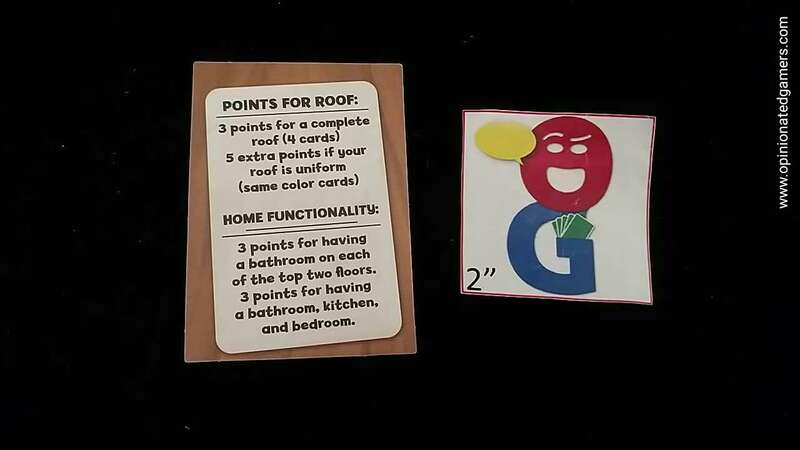 Then, for each roof card that you used which has a window on it, you score one point per window. The player with the most points wins. 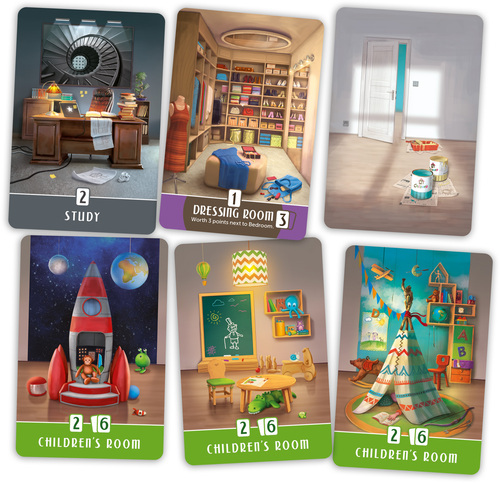 The very interesting tiebreaker goes to the player who has the most children (or parts of children) depicted on the artwork in the room cards of their Dream Home. So far, this is one my favorite new games that I brought home from Essen 2016. It is a light game which may find itself in the running for the Spiel des Jahres next year. That being said, don’t be misled by the kiddie cartoony art on the cover. There is still a lot of game here, even for veteran gamers. The rules are quite simple – draw a pair of cards each round, place the room card in your house and then figure out your resource card. The rules for placing room cards may limit your card selection, though if the resource card is good enough, you might be willing to take a room card that you can’t play and use it as an empty room. Managing your building spots is fairly important early on. As you can only build in rooms that have something underneath them, you really need to work on making sure you have different places to play room cards or else you may be forced to close off expansion possibilities on a big living room or you might be forced to play a room as an empty room. The different mechanisms work together well, though I do think the roof collection and scoring is a bit of a bandage (i.e. they had to do something with the rest of the resource deck). The décor cards give you some interesting decisions – they are worth good VPs, but you have to weigh those points against a possible early finishing of a room. The helper cards all have useful special actions, and some are clearly better than others – but you’ll just have to use your judgement on the relative value of these when you are choosing which pair of cards to take. Being able to break the rules can really give you a huge boost – especially being able to switch rooms in the market or being able to switch rooms in your house at the end of the game (i.e. get a chance to expand an already finished room). First player moves fairly often; I’d say that so far in my games, the leftmost room card is chosen in over half of all rounds. Sometimes, you just really need the room card that is there, and you’re willing to go without a resource card; but other times, you just want to not be picking fourth in order so that you have a better chance of getting what you want. As I mentioned earlier, the art is fairly cartoon-y, and I think that this will help its appeal with families and kids. The room art is good, and when your house is done, the varying rooms really make it feel like you have each constructed your own house. I also really like the inventive tie-breaker rule – which is finding the most children (or appendages) in the different rooms of your house. Games play in about 30 minutes, and while there isn’t much to do when it’s not your turn to choose rooms, there isn’t a lot of time between your turns. 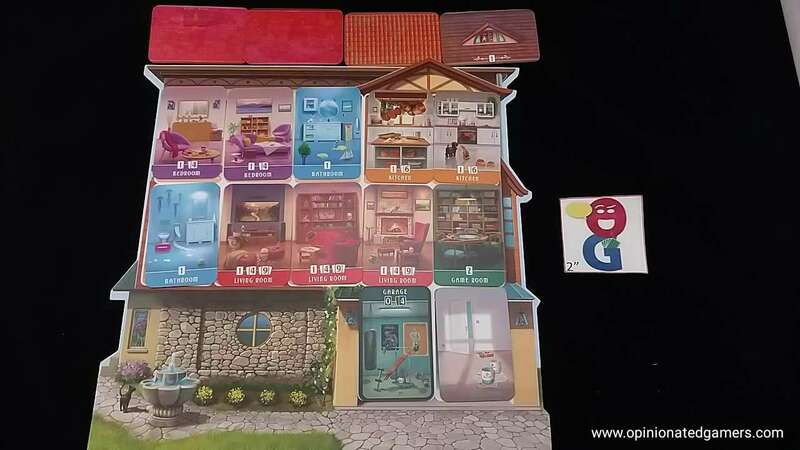 Knowing that you only have 12 room choices and plays makes each one a significant part of the game, and for non-casual players, this makes this family game interesting to play. Joe Huber (3 plays): From Dale’s comments, I was sure this would be a fine family game – but how would it work with gamers? I’m happy to say that it makes for a fine filler – closer to a 10-15 minute game, with the cartoony artwork likely dissuading “serious” gamers, but otherwise quite enjoyable, so long as you aren’t bothered by the idea of a big-box filler. Oddly, with gamers I’d recommend the rule change suggested for playing with children. The official rule for a 2 or 3 player game is for the first player to discard 2 or 1 choices (respectively) so that there’s always one more option than the number of players. I much prefer to leave all of the choices, rather than the practical gamer choice of discarding the second-best combination. Dan Blum (2 plays): In general I agree with Joe – this is a good filler. I also agree that with 3 players not discarding a column was fine, but I played a 2-player game with that rule (discarding 1 column – the rules don’t say to discard 2) and it was also fine.